This is the definitive Motor Patrol boot worn by officers in highway patrol and police motor patrol units. It's also worn by equestrian units which need a boot that's more sturdy and has a stiffer shaft than standard equestrian boots. 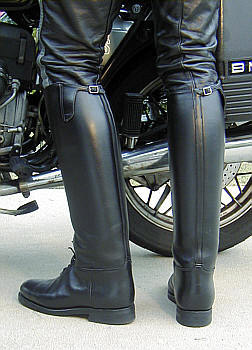 We discuss the differences between motor patrol boots and equestrian riding boots towards the bottom of this page. Click here to jump down to that discussion. As you scroll down this page there are many photos which show the details of construction for these custom made boots as well as their optional features. We've also devoted an entire separate page to present more information and detailed photos of each of the features and options. Click on the links to go to specific areas or click here to go browse that page in its entirety. Note that most of the photos you see here were made when these boots were new, fresh from the bootmaker and before they were polished and broken in. Once the boots have been worn and polished, they're appearance will change. See the picture which illustrates storm welting to see a veteran, well cared for, pair of these boots. 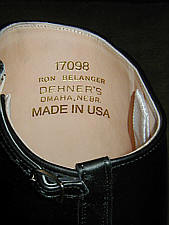 Each pair of these boots is custom made to your foot and leg measurements by Dehner's master bootmaker with the options you specify for your boots. The process starts when you fill out our secure order form to specify the configuration and options for your boots, continues when you take measurements and fill out the measure sheet and ends several months later when your custom made boots arrive. You can choose from several leather types and colors and can specify the type and thickness of the sole as well as the instep type and the configuration of the boot top. The boot you see here is in our recommended configuration. The boot is made from black Voyager cowhide. This is a tough leather which also takes an excellent shine. The boot shaft is lined in thick, stiff cowhide so the boot shaft keeps its classic shape, but the lining transitions to thick, supple elk-hide at the ankle so the boot will flex comfortably and cleanly at the ankles. The supple elk-hide lining continues through the entire foot. This careful construction detail is missing from most other motor patrol boots. The price for these custom made boots as shown here is $799. Prices for other variations on this style of boot are shown below along with prices for some optional features. Of course, your boots can be customized since they'll be made to your particular measurements and specifications. Here are the available options for the custom Motor Patrol boots. Our Boot FAQ (Frequently Asked Questions) page has a section which shows how to train new Dehners and how to care for them. Click here to see this information. 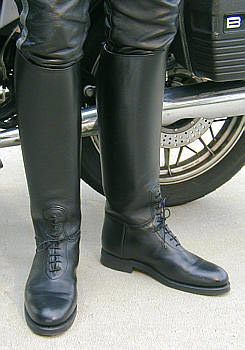 These custom Motor Patrol boots are available in the bal-laced instep or the plain dress instep, both of which are shown on the right. The traditional bal-laced instep is the most popular configuration for this boot, but some departments, particularly equestrian units, standardize on the dress instep. Click here to see the official specifications for these boots. These may be required by your procurement office. The bal-laced instep makes it easier to get the boots on and off since it allows the instep to be loosened. But once the boot is on and laced, it fits more snugly than the dress instep boots. The bal-laced instep also allows for some adjustment of the fit when wearing thicker or thinner socks with the boots. As the name implies, the plain dress instep boots have a more formal, dressier appearance. However, the dress instep boot may not be appropriate for everyone. The reason for this is that the boot strikes a delicate balance in the instep area between being loose enough for your foot to get into the boots but tight enough stay on your feet and to fit snugly. 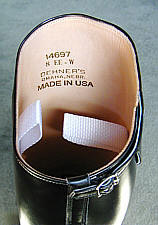 Dehner's master bootmakers are highly skilled in achieving that delicate balance, but the balance can be overcome, in time, if your feet grow larger. The top of the boots can be customized as well. The standard top has a gusset which is covered by a flap and a strap to adjust the circumference of the boot top up to an inch. 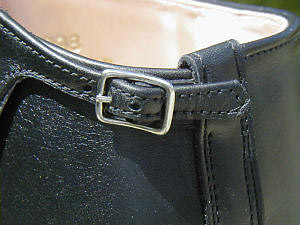 Note that the buckle is placed towards the back of the boot and away from the outside of the boot so if won't snag. This is the standard top treatment for the motor patrol boots. It's also possible to have the top made with lacing to adjust the fit of the boot top. Either method achieves the same result. Motor Patrol Boots and equestrian boots are variations on a theme. Both types are used to provide protection to the feet and legs with a touch of style and class but each type is adapted to its intended use. A shaft which is not as heavy and stiff as motor patrol boots to allow better feel of the horse. Not only is the lining leather thinner, it is often omitted on the side of the boots closest to the horse or omitted entirely so that the boot top is quite thin and flexible. There are also many style variations. 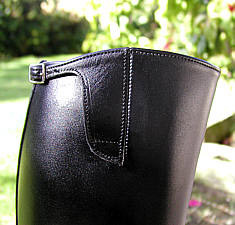 Hunt boots have top cuffs which may be detachable. For rougher conditions where form gives way to function, the equestrian boot of choice is the field boot which is usually laced, but sometimes comes with a 3-buckle top. 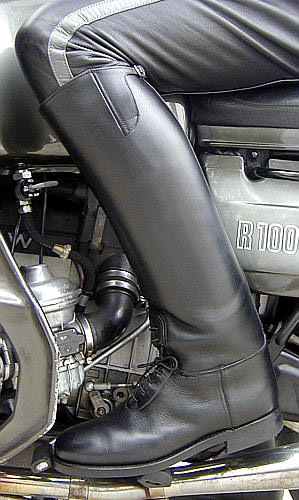 The field boot is closer in style to the motor patrol boots. Finally, there are Polo boots which have numerous variations and are a class unto themselves. All of these riding boots are custom made to measure by Dehner. Thicker Nitrene soles with a grip tread for better traction. The Motor Patrol Boots are generally more comfortable for walking than equestrian boots because the thicker, oil-resistant composition sole provides more cushion and support. Stiffer shafts with heavier weight lining leather to better hold their shape and provide additional protection. 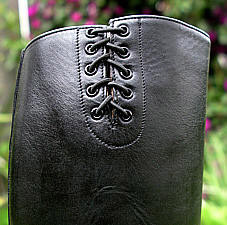 A "standard" boot top which does not flare as high as the Spanish top and is equipped with either a strap and buckle or with lacing to secure it. 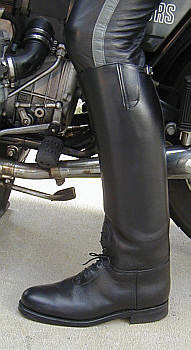 Supple elk hide lining in the ankles of the Motor Patrol Boots makes the ankle area more flexible. This is known as "wishbone" lining because of the shape of the cut where the leather transitions from stiff upper leather to the supple ankle lining leather. You can use a purchase order to procure these custom made to measure boots. Click here to go directly to the secure order form for these boots. Our secure order form for these boots will guide you through the details required to order these boots and allow you to choose from the possible options for these Motor Patrol boots. Note that you can go to the order form to see more information about the possible options and to download the custom measure form for these boots, but you don't have to place an order till you're ready. So please feel free to look over the order form to learn a bit more about these boots. You can always return to the form later, when you're ready to order. At the top of the order form you can click to get a copy of the custom measure form for these boots. The way the order process for these boots works is that you fill out our order form and click the Send button to transmit it to us. Then you fill out the measure form and send that to us via old-fashioned snail mail. You could scan it and email it or fax it, but the dimensions might be distorted and we'd get your fit wrong. Patience is the watch word with these custom boots. It takes a while to gather all your order details, make sure the master bootmaker has all the details and then to custom make your boots to your specifications and measurements. Boots take about 6 to 8 weeks during the winter and early spring, but production time gets longer in the late spring and summer when orders for motor patrol and equestrian boots are at their heaviest.